Pressure Washing can Reduce your Allergies! Pressure Washing to reduce allergies. Savannah and surrounding areas have a high level of allergens. Pressure Washing can reduce the irritation caused by pollen and mold. Pressure Washing – Savannah, GA offers allergen wash which removes the pollen and mold spores for the exterior of your home or office. Call to schedule your allergen washing! Pressure Washing – Savannah, Ga can get the exterior of your property allergen free. Below are two of our common allergen washing services. Pollen washing removes the pollen produced by plants and other surface pollutants from the exterior of your property. We can safely remove mold, rust stains, dirt, algae and many more. Mold washing removes the mold spores from the exterior of your property. Mold can cause irritation to your respiratory system. Our mold washing can greatly reduce the effects of mold. Do I need to wait until after the pollen stop before pressure cleaning? We often get this from homeowners “I’m going to wait until the pollen stops falling before I schedule my pressure cleaning.” unfortunately we only have about 8 weeks in Savannah doing the warmer months when pollen is not active. In Savannah, we have the tree pollen than followed by the grass pollen and eight weeks later we have the weeds pollen before we go into the colder months. 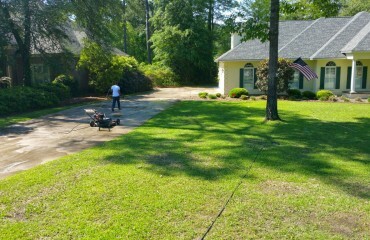 Pressure Washing – Savannah, GA can help reduce your allergies with our pollen and mold washing. Not only will these pressure washing services help your allergies, but they will also leave your property looking new. Our pressure washing services safely remove other surface pollutants from the exterior of your property. Pressure Washing – Savannah GA has provided Savannah, Pooler, Richmond Hill, Guyton, Port Wentworth and Guyton with safe pressure washing services since 2009. We have highly trained pressure washing technicians who pride themselves on producing excellent results when it comes to cleaning your property. If you are looking for pressure washing services whether it is to reduce allergies or just to clean the exterior of your property Pressure Washing – Savannah GA is your go-to pressure cleaning company. You can fill out our contact form or call/text 912-373-7722 for your free pressure washing service estimate.